University of Missouri Alumni Assn. Kansas City Metropolitan Bar Assn. George E. Bukaty is a commercial real estate specialist with Greg Patterson & Associates. George has been working with commercial and industrial clients since 1999. George is also the owner of an Investment Banking firm established in 1988. He has over 39 years experience in the securities field and has been involved in issuing and selling numerous mortgage instruments and derivatives as well as municipal backed instruments. George has also been actively involved in economic development throughout the Midwest for 32 years, having served as Chairman of the Jackson County, Missouri Redevelopment Authority (1984-2006), Chairman of the Jackson County, Missouri Tax Increment Financing Commission (1986-1992) and Secretary-Treasurer of the Kansas City, Missouri Planned Industrial Expansion Authority (1996-2008). He currently serves as the Kansas City representative on the Jackson County Missouri Board of Tax Equalization. 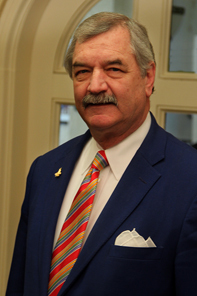 George’s unique background and community involvement have been extremely helpful to clients seeking economic incentives and creative financing alternatives. State of Missouri Tax Increment Financing Association, Inc.